Overall, it was a pretty laid back week around here. I’ve been pretty tired since going back to work, so most days we just hung around the house. We weren’t total homebodies, though: we did venture out to meet my friend Crystal for coffee on Wednesday morning, followed by mom-baby group at the hospital (we’ve been going since Parker was just a week old). Zach left on Thursday for a bachelor trip in Las Vegas, so it’s been just the three of us — Sadie, baby, and me. Poor Sadie is such a good sport. She doesn’t get nearly the attention she did back in the old days of having “only child” status, so I have been making a conscious effort to spend more quality time with her when Parker is asleep. She makes a good snuggle buddy while Zach is away! In other news, we did well with weight gain this week. Parker is creeping closer and closer to 12 pounds, which is still small for his age and height, but it’s progress. He’s been eating pretty frequently this week, which is definitely a good thing (albeit exhausting for me). I am loving the extra pudge on his cute little thighs…no more chicken legs for this guy! If you aren’t familiar with Tuned Into Learning®, then there is no better time to hop on over and check out this amazing resource. Their collection of music for special education is unparalleled, and I am beyond flattered to have the opportunity to offer one of my songs as a free download today. Get the “Fall, Fall, Fall” mp3, instrumental mp3, and lead sheet here. Tuned in to Learning® helps special learners ‘tune in’ through the powerful medium of music. They offer a wide range of special education songs and curriculum designed by an Autism Specialist and team of Board Certified Music Therapists. Their songs, books, videos and downloads help teach essential skills to students with autism, Down syndrome, Williams syndrome, brain injury, learning disabilities, speech disorders, orthopedic impairments, and other special needs. It’s awesome to have so many high quality options when it comes to finding new material for my work with kiddos who have special needs. 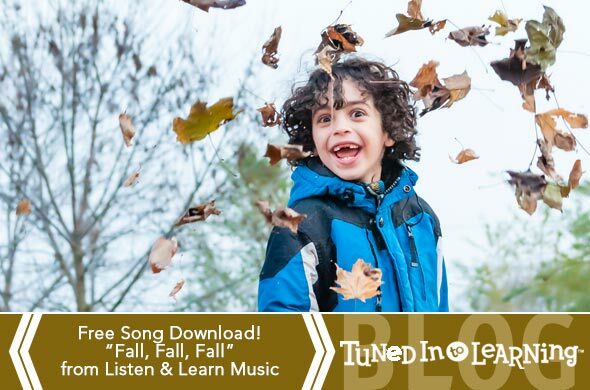 After you download my fall freebie, be sure to check out all that Tuned in to Learning® has to offer! Check out this big boy. Three months…that’s a quarter of a year! As sad as it makes me that time flies by so quickly, I love that Parker is becoming more and more fun and full of personality every day. Along with the three month mark have come several milestones and changes. The BIGGEST milestone is that he slept through the night 3 nights in a row! Zach and I woke up that first morning (September 11, so I can add it to the baby book later) and were in complete shock — neither of us remembered what it felt like to get a full night’s sleep, since it hadn’t happened since around the 6-month mark of my pregnancy (thanks to all those trips to the bathroom). I had to take a picture of Parker after he finally woke up to celebrate this monumental event. Another milestone is that Parker has discovered his feet. Whereas he used to be obsessed with looking in the mirror while on his playmats, now he just wants to grab his feet and try to put them in his mouth. He has actually succeeded in that a few times ;) He is like a little roly poly, even during his diaper changes, which is just too cute. Speaking of roly poly, he has rolled over again (belly to back) but only once since the first time. Luckily Grandpa Alan was there to witness it. I think he is getting close to rolling from his back to his belly, too…and we’re pretty sure that he’s going to be an early crawler. He already can maneuver his body 180 degrees to get to me or a toy during tummy time using just his arms. For such a little string bean, Parker is super strong! In general, Parker just seems to be a very happy baby these days. He has such a sweet personality, and that smile…oh man. My favorite is when he is in the middle of crying (especially when I start changing his diaper) and all of the sudden he stops and gives me the biggest grin. It is seriously impossible to have a bad day with this little boy in my life. Life is good around here. Parker is still eating great, and I’ve been working on getting more calories and drinking tons of water in order to produce more milk — I pumped 6 ounces this morning, which is HUGE for me! He’s still on the (very) low end of the weight spectrum, but I’m hoping to see a big gain on the scale today when we go to baby group. Fingers crossed! I’m doing a little happy dance as I type this post, because I finally have a new song to share after a several months long songwriting hiatus. I can’t tell you how good it felt to go through the process of writing, recording, and most importantly, using this song in a music therapy session. The Dolphin Song was written specifically for a student who is quite fond of these sweet mammals, though it could be easily adapted to feature any sea-dwelling creature. In the song, I pose the questions “where is the dolphin swimming to?” and “who is the dolphin swimming to?” because my student is working on answering “wh” questions. When we sing the song, I use a stuffed dolphin to “swim” to different places and people, and then I ask my student to answer the questions posed in the song. There’s room for lots of creativity and endless verses, though in my version, I only included a few and left two blank for the listener to fill in. Get immediate access to this, plus over 100 other songs, lead sheets, visual aides, and valuable resources for only $9.99 per month…learn more about becoming a member or just subscribe below. You won’t be disappointed! Members, click here to access this post. All good things must come to an end, and in this case, it was my maternity leave. I feel so lucky to have spent the past 12 weeks at home with Parker, even if it meant an entire summer without my main source of income (one of the very few downsides of self-employment). But on Tuesday, I kissed him goodbye at 3 pm and was off to my studio for my first full afternoon/evening of work since May. To be honest, I really loved it. Seeing all of my students again was so wonderful — they were excited to be back, and wanted to know all about baby Parker — and I remembered how much I enjoy the work I do. Knowing that Parker is only a few rooms away from me, and that he is in the care of his grandmas and our awesome sitter Greta, is what has made this transition manageable. There were definitely times throughout the summer that I thought I would enjoy being a stay-at-home mom, but heading back to work has confirmed that this is what is best for our whole family. I get to spend the entire day with my baby, and then do a job I love from the comfort of home. Financially, it allows us to save more, pay off our mortgage quicker (we’re shooting for 40 — that’s less than ten years away! ), and still have plenty of money after expenses to do the things we love, especially travel. Anyway, enough about me. Let’s get to my favorite topic in the whole wide world: my beautiful baby boy! Unbelievably, he is turning 3 months old tomorrow. Each week, he seems to become a little bit more chill and is smiling so much! He was so cute this morning when Zach brought him to me after changing his diaper at 6 am; I said “hi” and he had the hugest grin on his face. It was almost like he woke us up on purpose just so that he could see us! Luckily after I fed him, he went right back to sleep so that I could begin my 6 am routine of coffee, breakfast, pumping, and getting things done around the house. Parker is getting much better at taking the pacifier, which is a big plus since he’s spending so much time away from me now. It comes in super handy when we’re out in public, like yesterday when I took him to Target and he started getting a little fussy. It made me cringe thinking back to a few weeks ago (before he got the hang of the paci) when we were at Kohl’s, and he had a complete meltdown in the Ergo carrier. Hopefully we won’t relive that traumatic experience again. The one bummer about this week is that Parker still isn’t gaining as much weight as he was up until now. He is right under the 10% mark for weight, even though he is a good eater, and seems happy and satisfied after his feedings. He continues to grow in length like a week, so I’m just hoping that during his 3-month growth spurt, his weight catches up. This blog post is getting ridiculously long, so I’m going to end with a video of Parker’s first dip in grandma’s pool last weekend. He loved it!